Late check out (after 12:00 PM and before 1:00 PM) may result in a fee. You may request a refund up until 1 week prior to arrival. Full refund given within 48 hours of booking, if booked 14 days before check-in. 50% refund given if you booked between 7 and 13 days before check-in. Gold-Diggers is not just a hotel, it’s a bar, venue, and recording studio too. Which means guests must be 21 years of age to place reservation and stay at our hotel. A valid credit card and ID are required to make reservations at Gold-Diggers Hotel. Cardholding guest will be charged 100% of the reservation total when booked and a $100 security deposit at the time of check-in. Your deposit will be refunded to you in full when you check out, minus the cost of any items taken from the mini-bar or other charges you've agreed to during your stay. Gold-Diggers Hotel is located in East Hollywood at 5630 Santa Monica Blvd. Los Angeles, CA 90038. We recommend using a ride-sharing service (Lyft or Uber) for getting to/from the airport and for getting around town, as parking can be a challenge and ride sharing is often the most efficient. If you are driving to us and would like to park in our self-serve offsite parking lot, please make arrangements with us in advance. If you choose street parking, be sure to carefully read all signs and restrictions. Guests will receive a 4-digit code to the hotel door the morning of their reservation. That code is valid at 4pm check-in and expires at 12pm check-out the next day. If you would like to arrange early check-in or late check-out, just text us in advance at (323) 610-6972. Check-in is at the bar and check-out is at the hotel. Simply stop by the hotel office on your way out and place your key in the wall mounted drop box. We charge a $25 fee for lost keys. Gold-Diggers Bar is located just below Gold-Diggers Hotel and serves as your front desk. Our entire staff, including the bartenders, are trained and ready to help with anything you might need, so please don’t hesitate to ask for anything. We are all here to make sure every hotel guest completely satisfied with their experience. 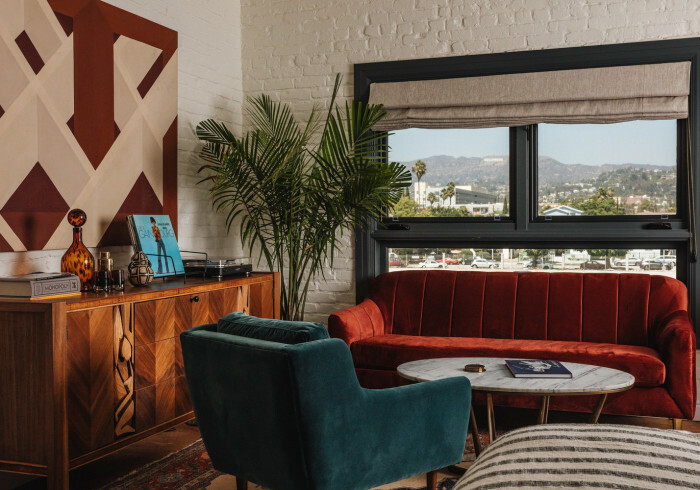 Welcome to your East Hollywood fantasy pad. A soft landing for a big night. Each room has its own distinct personality and corner-to-corner comfort. Dig in for endless treasures, including hand-selected vinyl and vintage cassettes and a limited edition Aquarium Drunkard x Gold-Diggers 12” vinyl mix that’s yours to take home. Or queue up your own music experience on your in-room Sonos. Music is the fabric of our space, and we want you to enjoy it day and night. Speaking of fabrics, we hope you like linen and velvet.